Auch beim PennyBlack Saturday Challenge ist man ins Neue Jahr gestartet und diese Woche steht *Embossing* auf dem Plan. Also hab ich eine meiner Embossingfolders für die Cuttlebug ausgepackt und hab ein bisschen gekurbelt. Übrigens ist auch das grüne Papier embosst, man sieht es aber auf dem Photo nicht. Well also the PennyBlack Saturday Challenge ist startet into the New Year and this week we are asked to "emboss" a little bit our card. So I have choosen one of my embossing folders for my cuttlebug. Also the green paper is embossed but you can't see it very well on the photo. 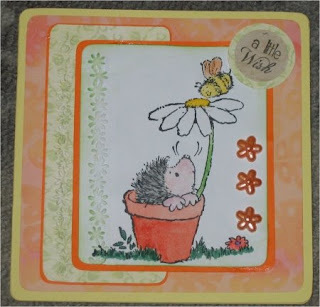 gorgeous card Heidi, love the embossing and this cute image - great work. Lovely sweet card, such a cute image.